1. Fresh Batch Starts every Sunday. 2. Candidates to report before 09:00 A.M. on Sunday. 3. Outstanding Candidates Wanting to Avail Hostel Facility can report on Saturday as well. SSB INTERVIEW COACHING IS SCHEDULED FOR 14 DAYS CLASSES WILL BE HELD FROM 09:00 am TO 05:00 pm. TOTAL 100 HOURS COACHING INCLUDES. Fee Concession for Serving Soldiers and Wards of Ex-Servicemen or Retired Defence, Para Military Forces and Police Forces & Students of Sainik / Military Schools. 2. Three passport size photo Graph. 7. Lunch – For day scholars. Hi everyone, My experience at Cavalier was good overall. You will get to know your weakness and will definitly improve it here. Their course structure help you forget your fears you have in your mind regardig SSB. I recomemd you to join this if you want to crack your SSB and become officer. Place where you are educated not for ssb only but for life. I am Sumit Kaliraman,I join caviliar to get SSB coaching for tes 39 course .after joining caviliar ,I am very confident to clear SSB .caviliar give good way to achieve my goal .I am thankful to caviliar . I'm thankful. i salute cavalier. I joined 14 days ssb course, n yes that's true after 14 days my mindset totally changed, way of thinking, executing the work. The psychology class taught me how to see beyond (to do things differently) all thanks to Dua sir. After gto class by Dhawan sir I lost my stage fear, increased my tact skills, group planning and how to manage and be with the group. This academy is a whole lot package to enhance ur psychology, to test your personality, build the character and most important dey bring out 15 officers like quality within you. At last they build the character about what all is required to be an officer. 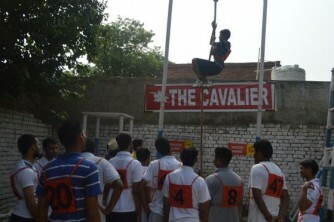 When I joined cavalier ...i was not mature for the ssb .But,after joining...and passing these 14 days here,I am confident enough to attend it. Well,imagination means what you want to see and what is here taught in Cavalier.It helped me a lot to improve my personality and now not only in ssb ,I am ready to face any kind of Interview . The outdoor tasks gives us a chance to think practically and apply it. The teachers here are officers and they are wonderful. Thank you cavalier. Hope that i can come up with some good news. Here at cavalier i came as student and i m going out as an afficer.i m sure enough for my ssb now .i have gained confidence here .faculties here are extremely helpful . Specially chopra sir, dua sir, dhawan sir.they are the most experienced defence teachers i have ever met. In short here i learned the concept of ..when it is dark enough we can see the stars.